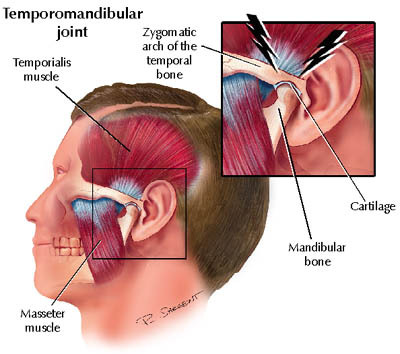 The jaw is a hinge joint connecting the mandible (jaw) to the skull and is surrounded by 68 pairs of muscles immediately in front of the ear on each side of the head. They allow you to chew, yawn, speak, and swallow and are in constant use. This joint is one of the most frequently used in the body. You can locate it by placing a finger in your ear and push forward while opening and closing your mouth. The articular disk separates the condyle head of the mandible and the skull. When this disk is misplaced it will cause Temporal Mandibular Joint Dysfunction (TMJ). Studies show about 35% of the American population has TMJ disorders. A common symptom could be having a limited range of motion within the joint. If you have TMJ, every time you open and close your mouth you put wear on the tissues of the joint. This can cause severe problems if not treated properly, so it is recommended that you seek a chiropractor for TMJ treatment options. You can test the range of mobility in your jaw by holding your palm vertically with your thumb facing the ceiling. Flex your index finger so it is out of the way. Open your mouth as wide as you can without strain or pain and place the three remaining fingers (middle, ring, and pinky) between your upper and lower teeth. I should have prefaced this by reminding you to wash your hands first. If you cannot fit all three fingers and you experience pain, it is possible you have TMJ. Dont be worried if only 2, or maybe 4 fingers fit. If there is no pain and it doesnt affect how or what you eat then, the diagnosis is probably negative. Commonly, TMJ is accompanied by noises such as clicking, grinding, or crunching when you open and close your mouth. The articular disk is fitted so that the condyle head of the mandible can slide smoothly up and down. The clicking noise will occur when the condyle head is not in the proper fitted position and passes over the ridge of the disk. As the bone passes over the ridge it will cause a click or pop that can lock the jaw in either the open or closed position and usually requires a manual adjustment to dislodge it back into normal working order. The grinding or crunching noises occur when there is bone on bone contact within the joint. If the articular disk is completely out of place or has worn through, the jawbone will move on its hinge, but in direct contact with the skull. This could be caused by arthritis wearing away the cartilage of the bones. If you experience noises when you move your jaw consult a chiropractor to help determine the severity. TMJ disorders have various causes. Misaligned or missing teeth can force the bone out of its proper position. Trauma from a fall or car crash can do the same thing. Whiplash is a very common cause of TMJ. Many times stress results in a grinding of the teeth or clenching of the jaw. This can over strain the muscles and cause serious pain. That pain can flow throughout your face, neck, and head causing various symptoms and discomfort. Similar to a kidney infection, that may cause vomiting, diarrhea, nausea, loss of appetite, or a bladder infection; TMJ may appear as various symptoms (headaches and earaches) that wouldnt normally be considered in conjunction with it. We have seen very good results in our office treating this condition. Typical treatment includes a combination of Laser Therapy, electrical stimulation or ultrasound, stretching and joint mobilization. We also provide home exercises and advice to follow.